This post is sponsored by SheSpeaks and Folgers. All opinions expressed are my own. Truth? I'm a bit of coffee snob. During my first year of college, I worked as a barista at a local coffee house. Thus began my love affair with all things coffee. If you follow me on social media, you know it's serious; my love for coffee is listed just beyond my proclamation of undying love for my husband and children. What can I say? It's a simple pleasure for me! As I'm currently expecting, I'm SUPER selective about my one cup of daily java. It has to be nothing less than great, people! 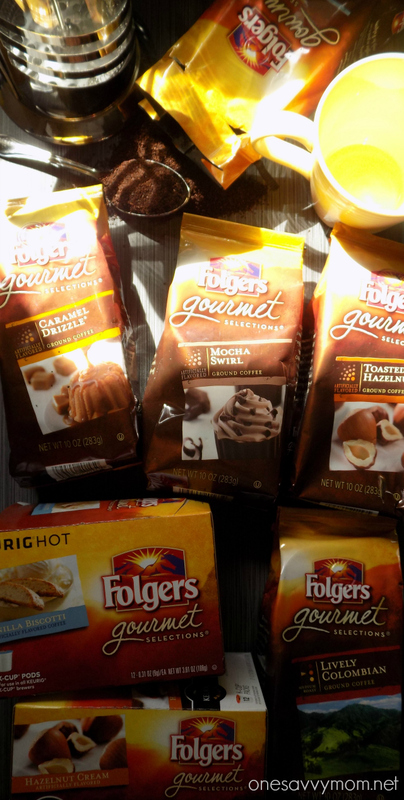 Some of my current favorites are from the Folgers Gourmet Selections line. The collection offers a decadent premium line-up of ground coffee and K-Cup ® pods to explore, at awesome price points. Boasting several flavors, you're bound to find more than one that you absolutely love! My current favorites are Vanilla Biscotti and Mocha Swirl. 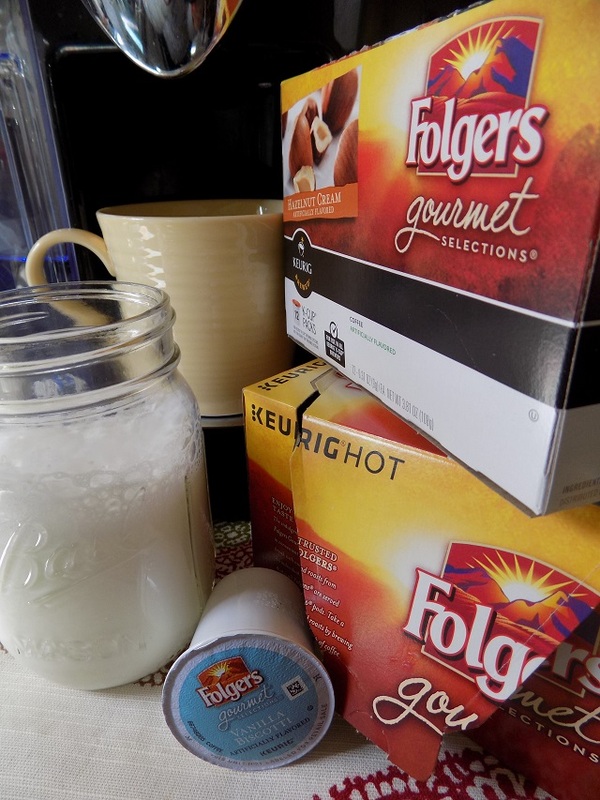 Read on for my easy coffee hack on how to steam & aerate milk without a machine, and enter to win our #GourmetAnyDay Folgers Gourmet Selections Prize Pack Giveaway! When my husband is home on the weekend, I go all out and use my coffee press to make a small pot of coffee, for the two of us to enjoy. I adore my coffee press, and when I use it with my favorite Folgers Gourmet Selections blends, it brews up the BEST cup of coffee, EVERY TIME! 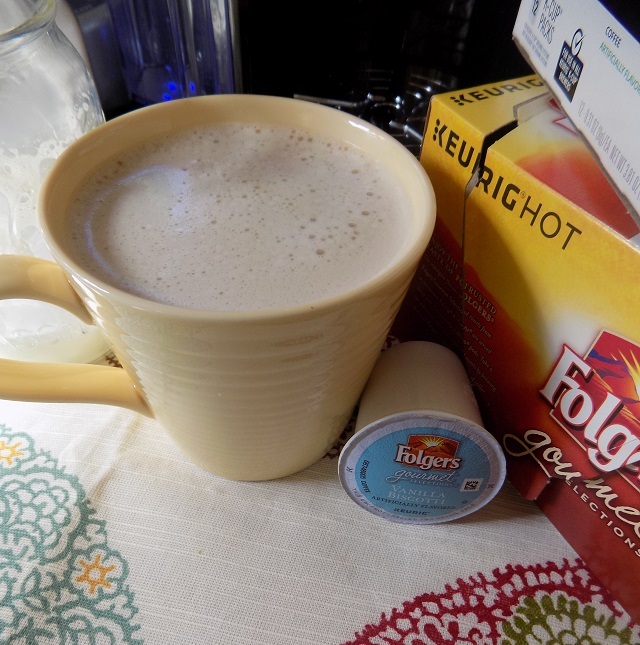 During the week I don't have a ton of time on my hands, so I usually use my single serve brewer and a Folgers Gourmet Selections K-cup pod to prepare a cup of coffee in the morning. Sometimes I'm in the mood for a bit more though and I get adventurous. Through some trial and error, I've learned a super simple and time efficient hack to steam and aerate milk! Perfect for coffee house inspired cappuccino's and lattes, without the need for a special machine. All you need is a microwave safe wide mouth jar or a container with an airtight / spill-free lid, milk, and a microwave! Ready? 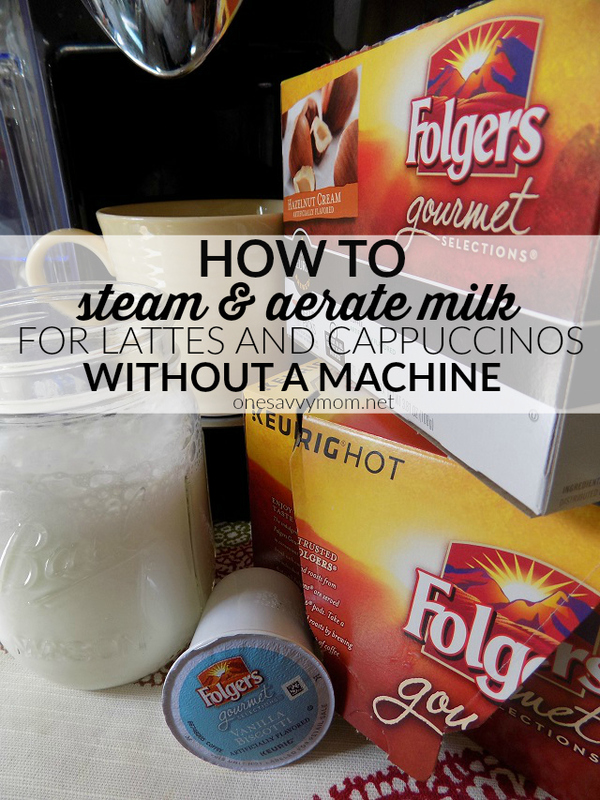 Here's my easy step-by-step hack on how to steam & aerate milk without a machine. Perfect for fuss-free DELICIOUS coffee house inspired cappuccinos and lattes, at home! 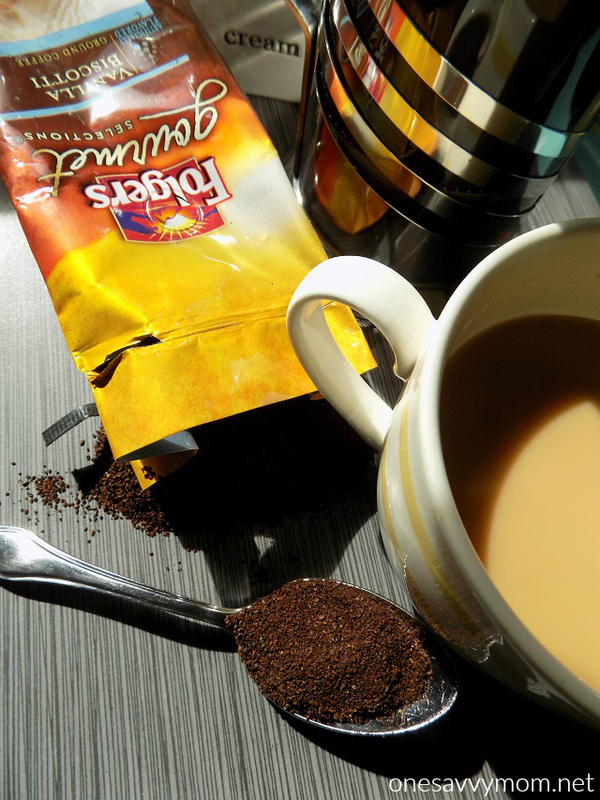 Brew 5 ounces of your favorite Folgers Gourmet Selections Coffee using a K-cup pod or ground coffee - your choice! ( I used a Folgers Gourmet Selections Vanilla Biscotti Flavored K-cup pod for the Cappuccino pictured below). Once complete, set your brewed coffee to the side for a minute or two. Add 1/2 cup milk to your wide mouth microwave safe container or jar. Place the lid on the jar and shake the milk vigorously for 30 seconds. Crack the lid a bit to vent the milk slightly. Place it in the microwave for 1 minute 20 seconds. Once complete, remove the container from the microwave. For Lattes, simply add the steamed milk to your brewed coffee, sweeten to taste if desired, and enjoy. For cappuccinos with a bit of frothy foam, replace the lid tightly on the container or jar, and shake the heated milk vigorously for about a minute. Carefully lean the cup of brewed coffee up a bit to meet the mouth of the container or jar and pour the milk / foam over the coffee. If done carefully the foam / aerated layer of milk will remain in tact, for a delicious coffee house style-cappuccino, at-home! This is one of my absolute favorite treats to whip up for myself during the busy week. It's amazing how a life-changing a few minutes of decadence and quiet time can be! When life gets busy, take a few minutes to slow down and relax with a cup of your favorite Folgers Gourmet Selections blends. I'm' positive that you won't be disappointed! (2) boxes of Folgers Gourmet Selections K-Cup® pods AND (2) bags of Folgers Gourmet Selections ground coffee! Entry is super simple - you can enter through the Rafflecopter form below. Giveaway ends April 7th, 2016 at midnight. Good luck! I want to try the peanut butter cookie coffee. I've had the sugar cookie and the caramel drizzle before! The Caramel Drizzle sounds oh soo delicious and would love to try it! I love the Caramel Drizzle! It is so delicious! I am really excited about the Caramel Drizzle. That is one of my favorites! My goodness Caramel Drizzle sounds so delicious! I really want to try the Peanut Butter cookie coffee. I think Sugar Cookie sounds amazing! A sweet treat without the guilt! I have never tried Folgers Gourmet before. I need to purchase coffee so I will be trying this out.